Google Calendar, including the one in Google Apps, is able to send unlimited free SMS alerts as the notification for events and all-day events. SMS text notifications are a boon for people who is always on the go and prefer to receive text messages for reminder of events and appointments on the phone instead. However, sometimes Google Calendar can fail to send any SMS notification reminder for an event at specified time, and worse, it can come to a situation where Google Calendar do not send any SMS alerts out at all for all events and appointments. The issues always happen when you’re updating or syncing with Google Calendar through third-party app or Exchange ActiveSync, such as iPhone and iPad iOS’ Calendar, Microsoft Outlook, eM Client and etc. The issue happens because the notification method for the events in Google Calendar has been changed when the events were saved or synced to Google Calendar. 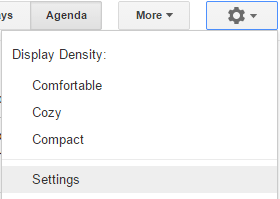 By default, Google Calendar will append the predefined event notification alert settings (i.e. where SMS notification to an event when it’s added to the calendar. 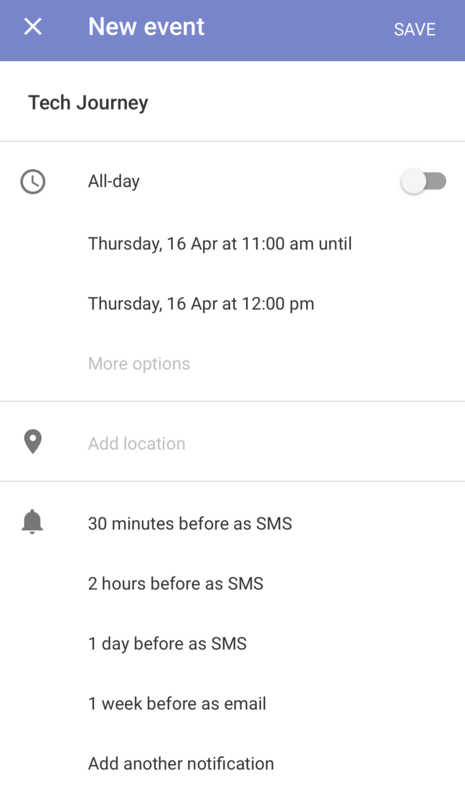 However, if you specified notification alert when adding a new event or appointment, these default predefined notification settings in Google Calendar are overridden and replaced by notification methods and timing specified by the individual event. Most third-party apps does not allow you to choose notification methods, i.e. SMS, Pop-Up or Email, so Google Calendar will fallback to Pop-Up when dealing with synced calendar. Resolve the issue where you don’t receive Google Calendar SMS notification or the Google Calendar SMS reminder does not work will depend on how you normally use Google Calendar. 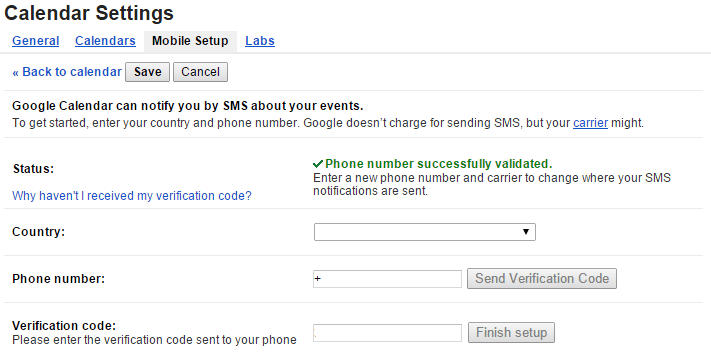 The guide assumes that you already have your mobile number defined and validated in Google Calendar. To verify or add your mobile number, web-based Google Calendar on a desktop computer. Then, click on Gear icon and select Settings, and go to Mobile Setup tab. When adding or editing a new calendar item, make sure that you select SMS for the notification method in “Event Details”. For SMS alert to work in Google Calendar, firstly configure that predefined default reminder notification settings for your calendar. To do so, login to web-based Google Calendar on a desktop computer. Then, click on Gear icon and select Settings. Go to Calendars tab, and click on Edit notifications link at the end of the calendar which you want to activate SMS text reminder. In the “Event notifications” and “All-day event notifications” section, configure the notification and reminder method and timing which you want to be alerted before each event. Remember to select SMS if you want Google to send you text alert. You can also choose to receive SMS text alerts for new events, changed events, canceled events and event responses. If you’re using Google+, note that notifications for events created on Google+ are sent by Google+. 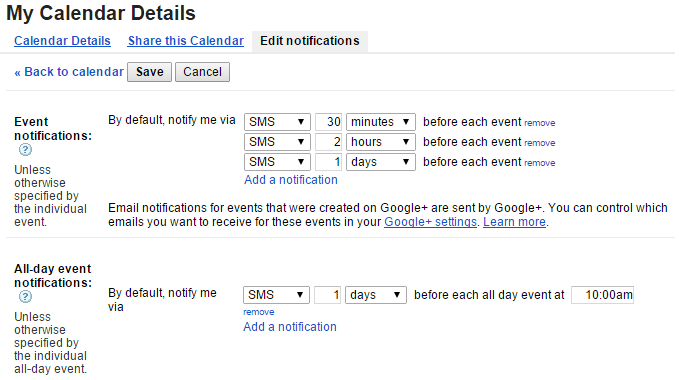 You can configure Google+ to send reminders via email, SMS or push notifications separately. Once the default notifications are set, you can now proceed to add and create new event or appointment. In Google Calendar apps for iOS and Android or Google Calendar loading in mobile web browser, the default notifications is automatically added to newly created event. You’re free to add, change or delete the notifications, but you can no longer add a new notification that delivers as SMS text message. Google Calendar translate “timing before” to “pop-up” while the only other option available is “timing before as email”. In third part apps that use Exchange ActiveSync or CalDAV to sync with Calendar, DO NOT set any notification or alert. If the app has default alert that applies to calendar items, remove or disable the alert. When an event without any alert or notification configured is synced and added to Google Calender, it will automatically apply the predefined default notifications of Google Calendar to the event or appointment. And voila, now you have automatic SMS text reminders for free.